There's only one week left, y'all. Trio on the Green is a definite must-try for your 2017 State Fair of Texas experience. Father and son concessionaires Rudy and Justin Martinez opened Trio two years ago. Since then, they have mastered the typical state fair foods with several concessions that offer funnel cakes, turkey legs, foot-long corny dogs, and even Krispy Kreme burgers. Their desire to branch out into a greater culinary experience is seen in every aspect of Trio. The area itself sits under the shade of three bountiful oak trees. The beer, wine, and cocktails are offered in flights of three, and the chef-prepared menu is served in portions of three. Hence the name Trio on the Green. Everything on the menu is made from scratch by chef Ryan Niemi. The offerings range from pimento cheese tater tots, sweet potato fries, stuffed peppers, ribeye sliders, falafel sliders and mini fried fruit pies. Justin’s wife, Megan, is vegan and she has in many ways influenced the menu. Trio has some of the best vegan options at The State Fair of Texas this year. I am a meat eater but will choose the falafel sliders with avocado hummus every time because they are so full of flavor. The food may get you there but the drinks and shade are what will keep you in your seat. They have several cocktails which can be served as the trio flight or in their signature plastic Mason jar. The wine selection rivals of many restaurants in Dallas and you can even purchase it by the bottle with your State Fair coupons. They have a great selection of craft beers and ciders on tap with several new options popping up throughout the fair season. 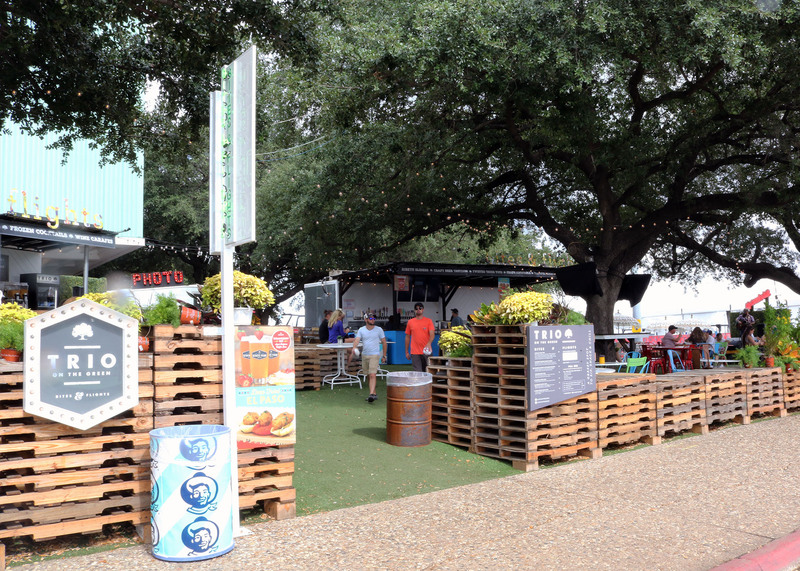 Trio on The Green is located on the south side of the Cotton Bowl, across form the Texas Lottery tent, near Gate 12 of the State Fair of Texas. You can find them on Facebook and Instagram.